This sweater has been getting a lot of comments and requests for information – so I thought I’d tell you a bit about it. It’s a simplified two-shade version of my Strathendrick design, which I produced for my West Highland Way book. This sweater says quite a lot about my design process, and the integrality of Mel to the whole thing. When I started work on Strathendrick (over a year ago) I was understandably nervous about knitting a gigantic expanse of colourwork, steeking the sweater’s armscyes and neck, then discovering when I cut it open after several weeks of knitting, that the design wouldn’t work (because at that point I’d be unable to unravel). So, rather than starting with an experimental sample, I graded and wrote the pattern, and Mel kindly offered to knit a plain version, as a sort of toile. We chose Milarrochy Tweed shades ‘Ardlui’ and ‘Horseback Brown’ for this enterprise: two of my favourites individually in the palette, and especially nice together because of their shared orangey tweedy flecks. Mel’s two-shade Strathendrick worked out perfectly, and once I knew that the pattern was just fine as written, and that a colourwork sweater in a tweedy yarn with an oversized shape was likely to look pretty bloody good, I went ahead and knit up the stranded Strathendrick I’d originally designed. Typically, I also retained both my and Mel’s samples, and since then, both sweaters have been on hot rotation in my wardrobe. This is pretty much how we work. Sometimes Mel swatches first, I design and grade, and then she knits a sample, making suggestions for adjustments to the pattern as she goes. Or often I’ll swatch and knit a sample completely experimentally, after which I grade and design the pattern, and Mel will test my work by knitting a further sample. We end up with a lot of samples . . . and it is fair to say that I wear a lot of them. Mel and I have worked together in this way since the very first pattern I published (o w l s) and while I think I’m kind of ok at making pattern instructions clear, it is Mel who often makes my patterns more ‘knitterly.’ I’m always grateful for her input. And, of course for all the fabulous sweaters. With Strathendrick Mel’s sampling was particularly important because I was working with designing a new shape: would a sweater with 33 inches of positive ease even work for me? Not only does it work, its a shape I now can’t get enough of! I am rather enjoying this slightly cooler weather because I can now wear my oversized Strathendricks once again. If you would like to make a 2 shade version of Strathendrick, here’s some notes to help you. 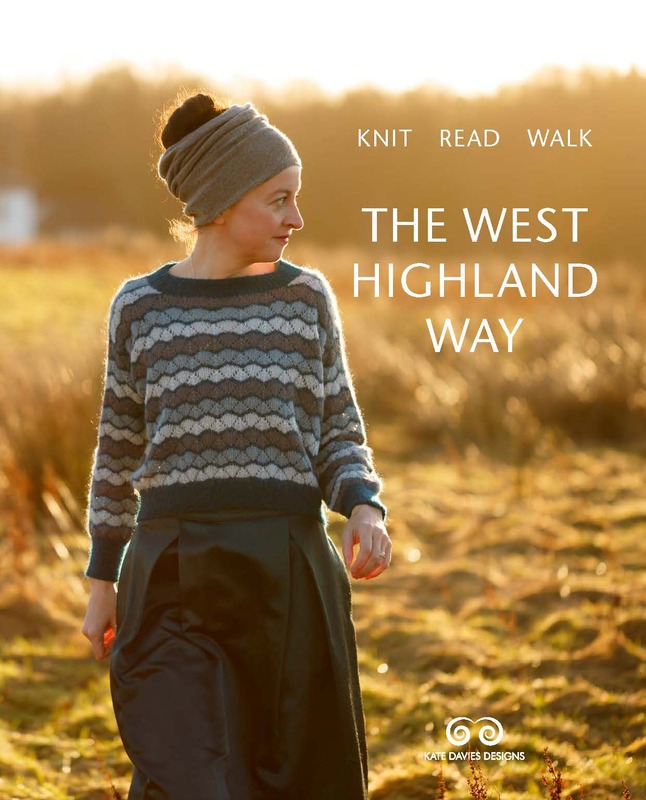 You’ll need either a copy of the individual pattern or my West Highland Way book. The pattern is written with a provisional cast on, the idea of which is to allow you a little leeway for adding / reducing the length of the sweater at the end by adjusting the depth of the hem rib. But if you would prefer to start with the rib, simply knit the two split sections separately (back and forth) in shade B, then join in shade A (to work in the round) to knit the body. Work body as per pattern in shade A. You can steek the armscyes, just as you would do with the colourwork version, working exactly as per pattern, or you might choose to knit the upper body back and forth. If taking the latter option, just ignore the instructions to add armscye and neck steeks in steps 3 and 4; separate back from front and work the upper body in two pieces, before grafting the left and right shoulders as per pattern. If continuing to work in the round, follow the pattern as written. Pick up stitches for the sleeves in shade B knit down to the wrists, adding ribbing in shade A. Finally, work neck and hem ribs (if necessary) in shade B.
Hello Kate, this pattern of two colors is really beautiful. the one that you sell, of many colors in Ravelry is the same ?. I am from the South of Chile, almost at the end of the world. Un abrazo. Question about the book Handy Woman…how can some of the things you experienced and the wisdom you put forth be adapted to the aging process! I am 78 and would love to be able to be more engaged creatively! Life seems to be running through my fingers like sand! I am a knitter but not very accomplished! Imwork at adding to my abilities…never say I can’t make that…I just plunge in and get help as Imneed it! Well, I think you have exactly the right attitude Toni – just go for it! I absolutely LOVE this 2 color tweed/plain version. This is gorgeous!! You are rocking the new hair do! I’m reading “Handywoman,” too, and it’s a beautiful, open-hearted book. I’m finding your story very compelling; it’s very moving to read about your determination and resourcefulness in teaching your body to relearn the functions that previously were effortless. I hope if I should have a life-changing physical challenge that I can follow your example! I love both versions of this jumper. I was going to say it won’t suit me because I am fat and big busted, but then it occurred to me that, actually it probably would suit me, knitted to my size, it would hide all of that. So I am going to have a go. I would love to know where you purchased the necklace. I love the sweater too. This is beautiful as is the stranded version…is the the two colour version stepped as well? Love this sweater. I love your hair and cut. You look beautiful. Even though I loved your long hair you look so free and strong with this new look. Ready to simplify my hair. You look very pretty with short, grey hair! Kate, the sweater and you reflect beauty and simplicity. I hope you always wear your hair the way it is in the photo. Kate, you Tom and Mel are an awesome team, so creative and talented. So are Bruce and Bobby! You never cease to amaze and surprise with your wonderful creations. Love this version of Strathendrick. Have been having a love affair with Buachille for quite some time, currently in a Furze phase, but Millarochy is sneaking it’s way in. Currently knitting Traigh, the lace is so pretty. This mod version of Strathendrick is on the list for next winter, as we are approaching Spring in South Australia. It only took 10 days for my latest wool from your warehouse to arrive, so quick, thank you all. I absolutely love this sweater — please consider making it into a kit! I never guessed that it was the same pattern as the original stranded Strathendrick. The collaboration between you and Mel is wonderful — you are both so talented, creative, and unique. You and your Sweater looks amazing. It looks like you change your Style after you cut your Hair. 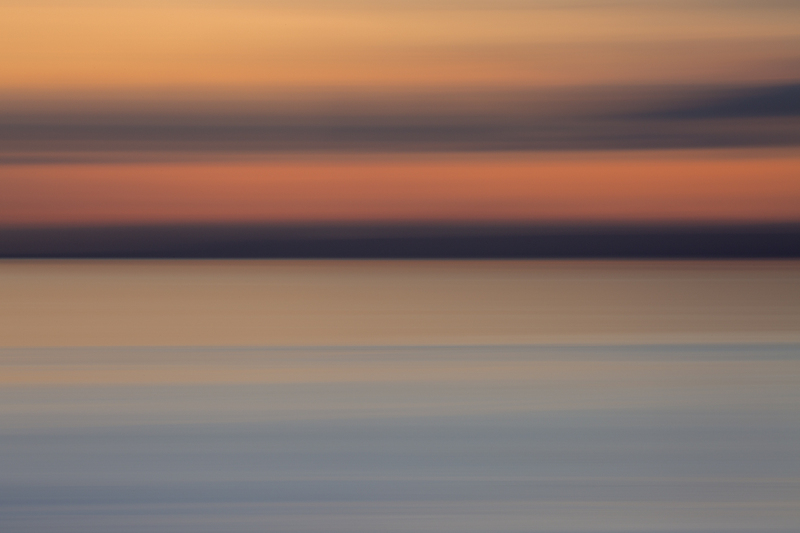 Does the color work version drape as lovely as the two color version does? 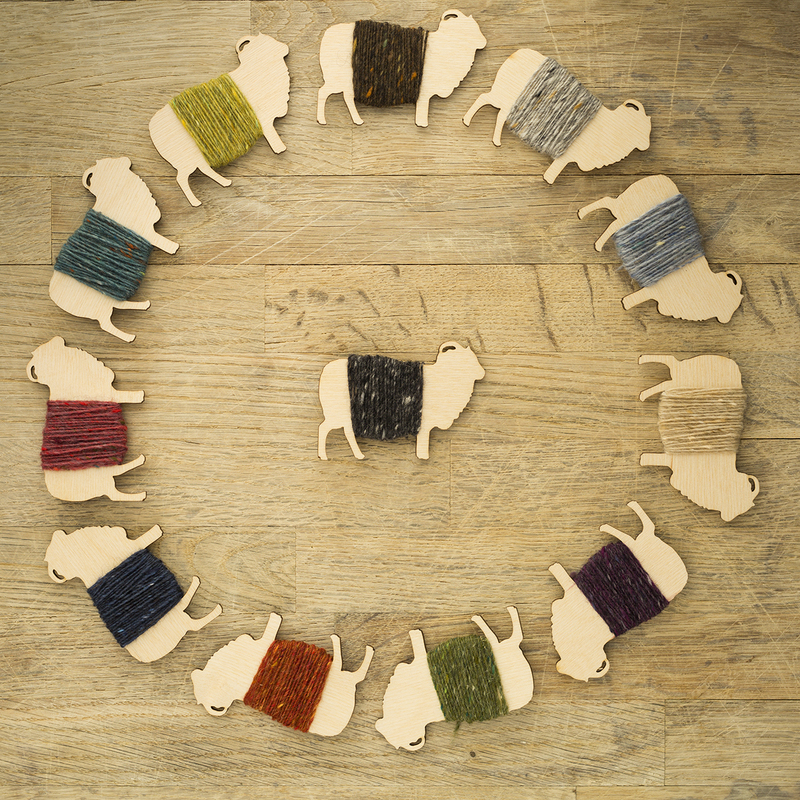 Love the plain two colour version of Strathendrick, but love your hair even more…..both beautiful! The two color version of your sweater is absolutely fantastic! I love the tweed! I think the original is very beautiful too but as a “round” older woman, I think the two color version would suit my shape better. Thank you! I love: that one pattern can look so different when knitted in pattern or plain – and your hair – it’s fab! This version is gorgeous. Love those two colors and the opposite use of colors. Also love your total styling in this photos, especially the socks and necklace with the sweater. But do tell — those pants looks so comfy — where did you get them or what brand are they? What a stunning version of Strathendrick! It ist a completely new look, and once more, I really, really love your style, Kate! Beautiful sweater. Now, please, tell us about the necklace. You are totally owning this sweater!!! And I have to say, late to the party, but I love your hair!!! Beautiful – and I’m guessing this version has more drape, without the additional layers of stranding? Thanks for including an account of your process and how you and Mel work together – now I’ll have to research what grading means in terms of pattern development. Sensational! That wide field of Ardlui is SO beautiful. Love simple garments and this caught my eye but didn’t associate it with the stranded version. Nice surprise that I have already have the book. So glad you posted Meg’s version. Thank you for these notes! I have the book and LOVE this oversized sweater! It is definitely going in my knitting queue! By the way, I love love love your short hair!!! I love this – and the colours are stunning. As a 46’’ lady myself, I was worried I would have to knit a tent size for myself, but less positive ease would also work I think. Very interesting to hear about the whole design process! Love your work. It’s wonderful!!! I’m so in love! Love the design! Adore your hair!!!! Hi Kate, I love this version on you too. Colourwork on the scale of the original design would be beyond me, but the plain version is also beautiful. You are very clever in your designs. Great team work with Mel. Thanks for this, cos as soon as I saw it, I thought how do adapt the pattern, I want one! It’s amazing in colour work but my simple mind absolutely loves the brilliant simplicity of this version…. Those shades are stunning together … I love the shape of the Strathendrick! What a great team you are. I love those colours, it’s just a gorgeous jumper. I want one! Trouble is my track record of knitting isn’t good. I managed to knit a tank top for my son when he was a baby, without a pattern and using up bits of wool. It was basically multicoloured 2 squares, sewn together at the sides and the seams. That was 36 years ago and I haven’t managed to finish anything since! It looks stunning on you! A great way to change up the pattern and try out the size that best suits you before doing all the colour work. The two colours work beautifully together. Oh wow! I never would,have thought of doing that with this pattern… and it looks amazing!